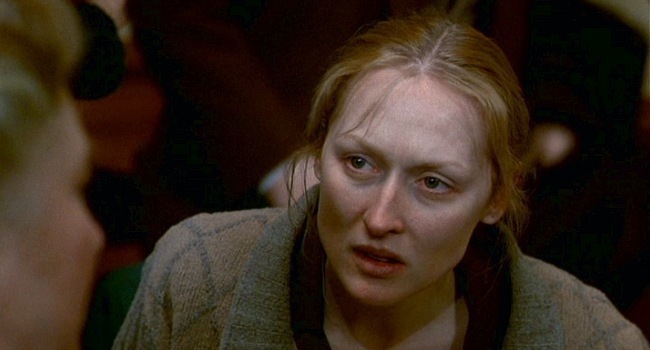 Sophie (Meryl Streep) is a Polish immigrant to New York in a volatile romance with biologist Nathan (Kevin Kline). When they meet young writer Stingo (Peter MacNicol) the three grow very close, with Stingo learning about Sophie’s traumatic past as a victim of the Nazis. Most films about the holocaust, such as Schindler’s List or The Pianist, aim primarily to show the horror of the Nazis’ crimes, and use a story as a means of doing this. Sophie’s Choice is different in that it feels like it is a story about three individuals first, and the holocaust second, as more time is devoted to the three in 1947 America than to Sophie’s past. The American side of the film is fairly typical romantic drama fare, with troubled artsy types, idyllic settings and a firm anchor in the interaction of the three main characters. There’s something of The Talented Mr Ripley about these scenes, in stark contrast to the flashbacks, which are more Schindler’s List, as Sophie is made to work in the house of Rudolf Hoess (Günther Maria Halmer). The non linear story structure works well, as the enduring impact of the hideous events on Sophie’s life is shown, although the film does at times feel rather slow, particularly towards the start. Meryl Streep is, unsurprisingly, outstanding as the lead, acting as well in thickly accented English as in Polish and German. Thankfully this film opts for having the German bits in German and the Polish bits in Polish, avoiding the awful technique of having English in that language’s accent. Kevin Kline is also very good as Nathan, showing off his piano skills as well as his acting skills. Sophie’s Choice is a very well made film, kept alive through its outstanding performances.